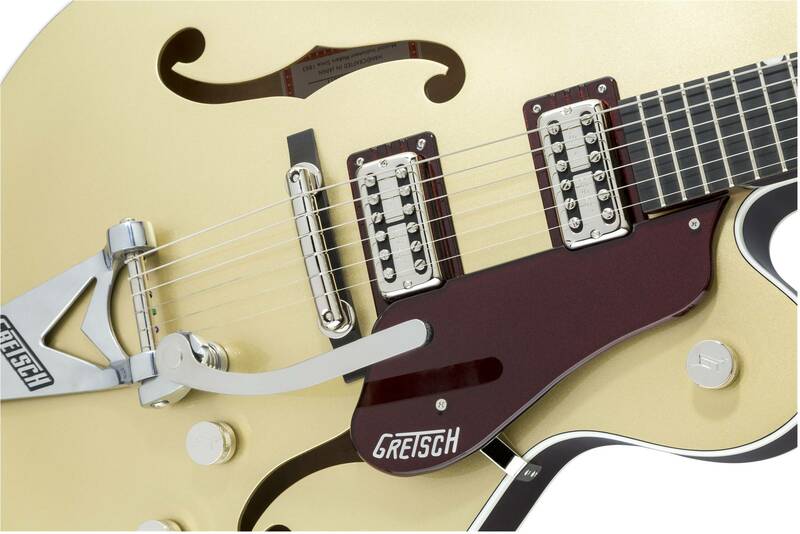 For well over a century the Gretsch sound has been recognized as big and powerful, loud and clear. To commemorate 135 years of remarkable sound, we proudly present the Limited Edition G6118T-135 Anniversary™ with Bigsby® guitar. We begin with a 16-inch, 3-ply maple hollow body with '59 trestle bracing that is powered by the acclaimed High Sensitive Filter'Tron™ pickups. Together, this combination provides the big-body power, crisp snap and exceptional fidelity that has made Gretsch famous for over 100 years. The body features an opulent 2-Tone Casino Gold on Dark Cherry Metallic finish and is adorned with matching pickguard and pickup bezels to create a look and style as big and unmistakable as its sound. 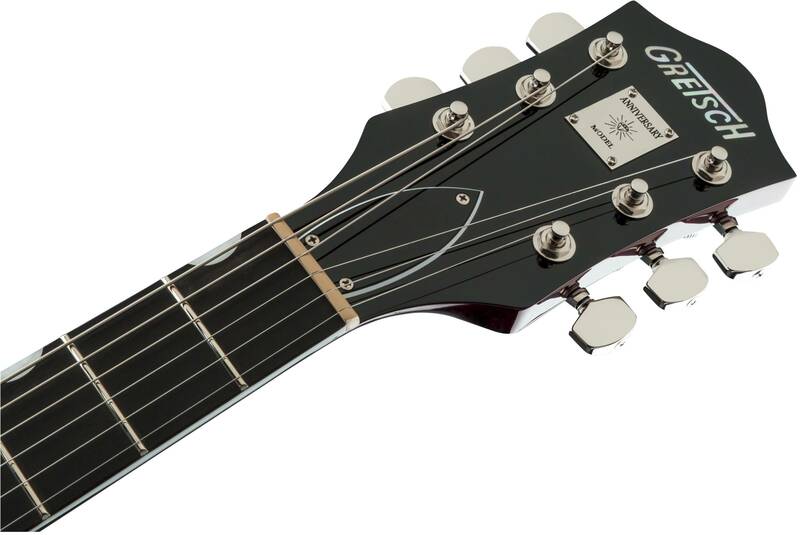 Rest assured the G6118T-135 has plenty of "go" with its "show," and is equipped with a String-Thru Bigsby® B6CP tailpiece, locking tuning keys, master volume with treble bleed circuit, master tone and individual pickup volume controls. 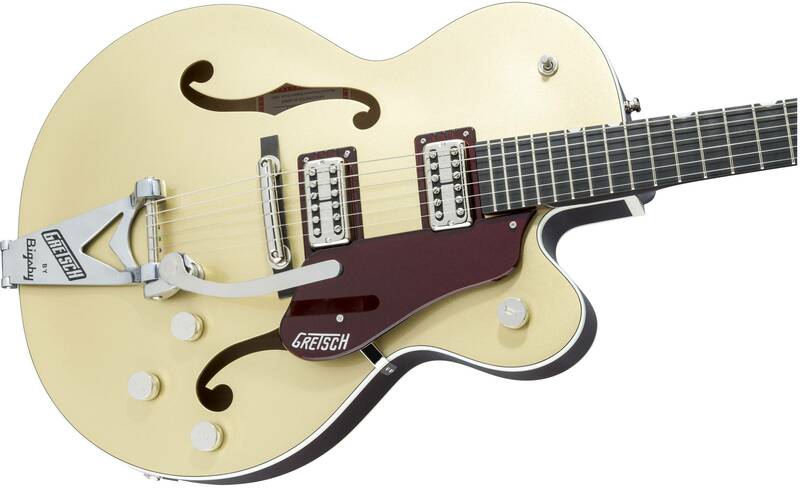 Additional premium features include a three-piece maple neck, 12"-radius ebony fingerboard with 22 medium jumbo frets, pearloid Neo-Classic™ thumbnail inlays, matching mother of pearl Gretsch logo on headstock with an Anniversary model plaque. The G6118T-135 also features chrome G-arrow control knobs and hardware, rocking bar bridge on pinned ebony base and Gotah® locking tuners. Includes a deluxe hardshell case.